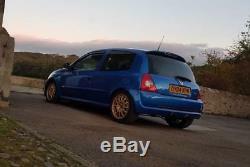 2004 CLIO 182 PH2 FF MODIFIED Here I have for sale my 2004 Clio 182 in Arctic Blue with both cup packs (full fat). 137k miles The car benefits from recent work and a number of desirable upgrades, the cost of which far exceeds the price I'm asking: New front pads and front calipers serviced and discs replaced this month New oil pan in July Oil change and new filter in July Clutch recently changed Belts and dephaser done less than a year ago PMS top mounts and strut brace Gaz rear adjustable shocks Whiteline rear anti roll bar Apex springs Yokohama AD08Rs fitted this year Stunning gold 15 wheels ECU remap Janspeed exhaust Cup spoiler Short shifter Omp wheel and boss All polybushed apart from front arms Corbeau forza sport bucket on Jon xtra low subframe Grey and yellow side bullets Metal battery cover Front splitter French colour grill Black inlet manifold Uprated induction Upgraded headunit Eml on due to unplugged rear lambda as was throwing up an engine light anyway as cat is blocked but have a decat to go with it and front bumper is scuffed but for the spec i think this is priced very fairly. 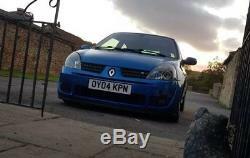 The item "2004 RENAULT CLIO SPORT 182 CUP FF" is in sale since Tuesday, December 25, 2018. This item is in the category "Cars, Motorcycles & Vehicles\Cars\Renault". The seller is "paulie-94" and is located in Wigan.